What makes Seattle such a family-friendly place? There’s a lot to do: shops, restaurants, and—as you get further out—nature. Where do you take visitors with kids? We usually go to Pike Place Market (*First Ave and Pike St; pikeplacemarket.org). You get a great view of Elliott Bay and also of the city. We might grab lunch there and then head to either Woodland Park Zoo (*5500 Phinney Ave N; zoo.org) or Seattle Aquarium (*1483 Alaskan Way; seattleaquarium.org). Or we’ll go to Lake Union and do the year-round Sunday Ice Cream Cruise (seattleferryservice.com). It’s a cute boat, and they cruise around Lake Union. You can buy ice cream on board—the kids love that. What are some favorite family restaurants? I like Tutta Bella (*4411 Stone Way N; tuttabella.com), especially if we happen to go over to the zoo. They can pull pizzas for the kids, and there are a lot of different artisan ones for adults. Bill, my husband, will bring the kids to barbecue places like Bitterroot (5239 Ballard Ave NW; bitterrootbbq.com). The kids really like ribs. They get a whole rack of ribs and split it between the three of them. And if we’re by the zoo, we’ll go to Molly Moon’s (1622 1/2 N 45th St; mollymoon.com). The kids like the Scout Mint flavor there. 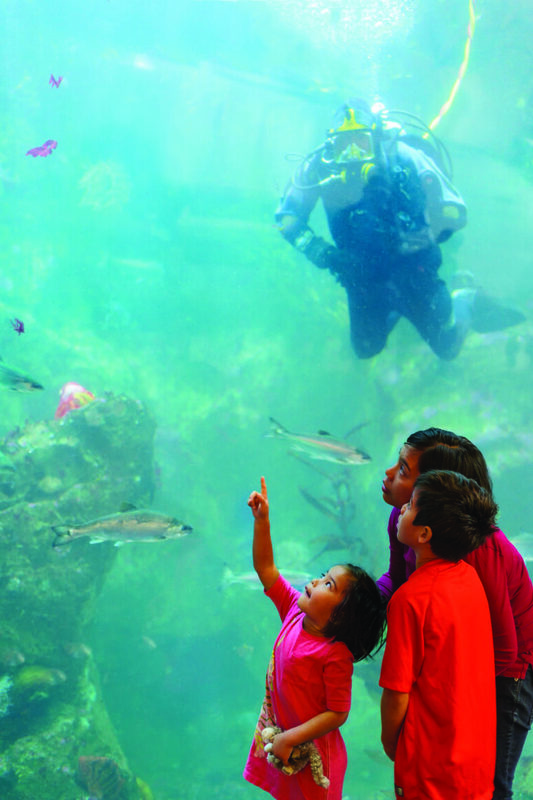 What Seattle attractions do all the kids enjoy? A big one is Pacific Science Center (*200 Second Ave N; pacificsciencecenter.org). We might watch a movie in the IMAX theater first, and then look at the exhibits. Felix ends up learning something, and the other kids like to run around and play with all the interactive displays. They also have a big playground outside where you can shoot water. There’s a huge slide and string bridges. There’s another playground that smaller kids, five and under, can go in. And they all like playing in the International Fountain (Seattle Center; seattlecenter.com), just outside the museum. Do the kids each have a favorite thing to do? Camille and Sebastian like the zoo. Camille really likes the flamingos because they’re pink—those are her favorite to watch. Sebastian really likes the river otters because he can watch them swim. They both like the playground in the middle. They’ll climb the web and pretend they’re turtles and run in the cave. We spend at least 30 minutes in that playground. Felix likes the zoo, too, but his favorite thing to do is to go to Sounders (*soundersfc.com) soccer games with Bill. In winter and spring, what are some favorite family activities? We go up to Stevens Pass (*Summit Stevens Pass, Hwy 2, Skykomish; stevenspass.com) every Sunday in winter for ski school. But after ski school, they’ll ski by themselves. They’ve gotten pretty good. Felix and Sebastian can now ski black diamonds. We end up skiing until March. Then when things warm up, we go hiking. This year Camille did Rattlesnake Ledge (wta.org/go-hiking/hikes/rattle-snake-ledge), and she did really well. Felix, Sebastian, and I went up Mount Si (wta.org/go-hiking/hikes/mount-si), which was tough, but the boys liked it.